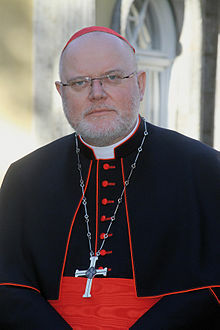 Cardinal Edmund Casimir Szoka, Cardinal-Priest of Ss. Andrea e Gregorio al Monte Celio has passed away on last Wednesday, 20 August 2014 at the age of 86. 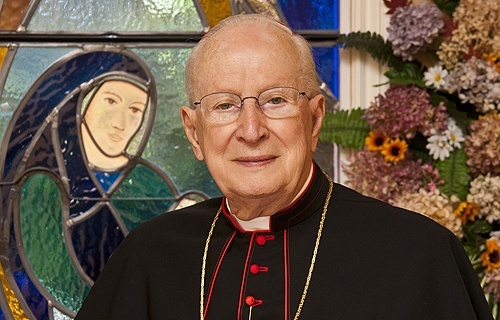 He was the Metropolitan Archbishop of Detroit, one of the largest and most important Archdioceses in the United States of America, from 1981 to 1990. 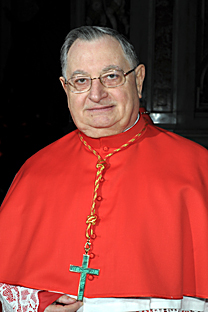 He was then appointed as the President of the Prefecture of the Economic Affairs of the Holy See, and the President of the Governatorate of the Vatican City State, a post which he held between 1997 to 2006, essentially the top prelate in charge of the day-to-day governance of the smallest country in the world, the Vatican City, where the heart of the Church is. 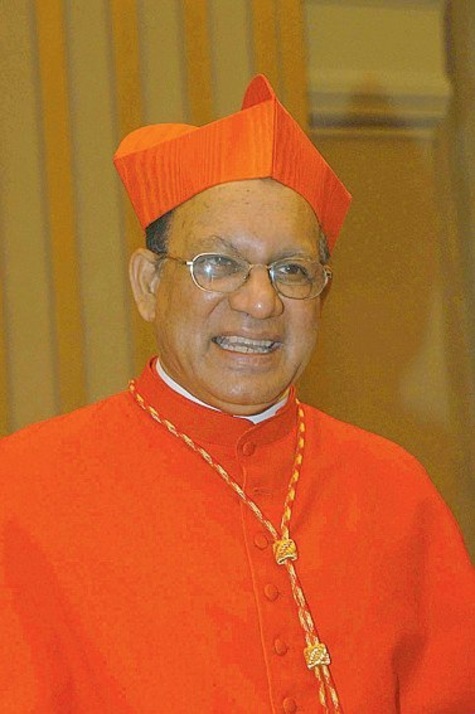 Cardinal Szoka was created Cardinal in 1988 by Pope St. John Paul II in his fourth Cardinal creation consistory on 28 June 1988. His motto was “To live in faith”. This means an emphasis on truly living the faith in the life he led, and truly, he had been faithful and had already shown that faith through the actions he had done in his long and wonderful life filled with total dedication to the tasks given to him and to the people entrusted to his care. 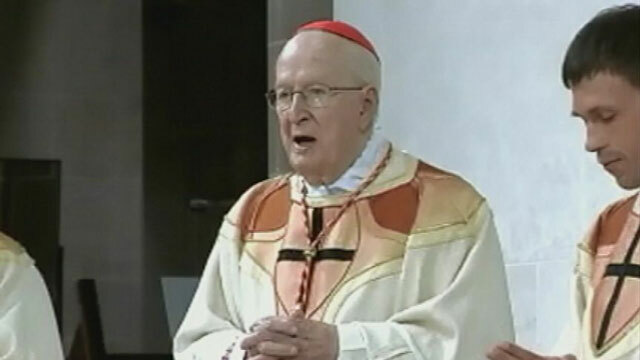 We pray for Cardinal Szoka, that he will rest in peace, and God will reward him for all his hard and great work as the long time servant of God as the shepherd of the faithful in Detroit, as well as for all the ministries and good works he had done for the sake of God and His people in the entire Universal Church in his dedication and work in the Roman Curia. May the Lord welcome him into His embrace in heaven and give him eternal rest and happiness that he deserved. 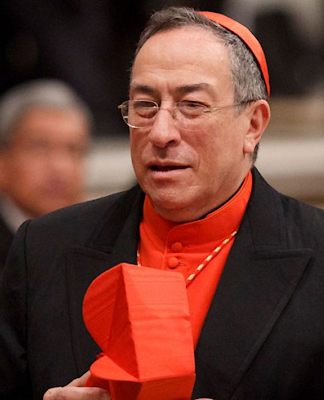 With the passing of Cardinal Szoka, and the recent aging out of Cardinal Carlos Amigo Vallejo, the College of Cardinals now stands at 210 members, with 116 Cardinal-electors and 94 Cardinal non-electors. The number of Cardinal-electors now is 4 below the specified maximum limit of 120. 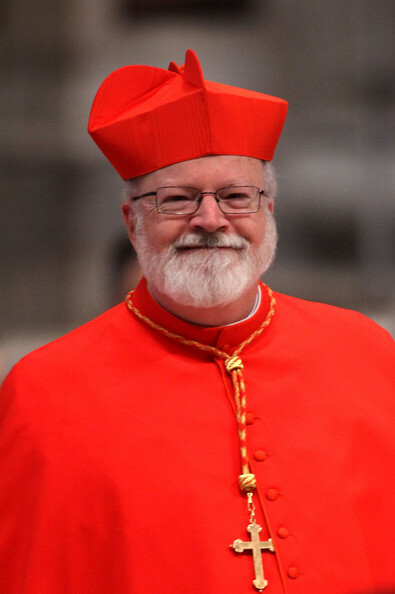 There are now 4 Cardinal-elector vacancy in the College of Cardinals, 0 vacant Cardinal Suburbicarian Sees (for Cardinal Bishops), 5 vacant Cardinal Titles (for Cardinal Priests) and 9 vacant Cardinal Deaconries (for Cardinal Deacons). The two great Popes of the last century, both of whom had been recognised as Blessed, through the virtues of their life and miracles attributed to them, will be declared Saints, in a ceremony likely to be scheduled at the end of this year (2013). Both Blessed Pope John XXIII and Blessed Pope John Paul II, who was made a Blessed just two years ago on 1 May 2011, had each left their incredible and remarkable footprint in the path of history, both in the history of the Church, and in the history of the world and mankind. 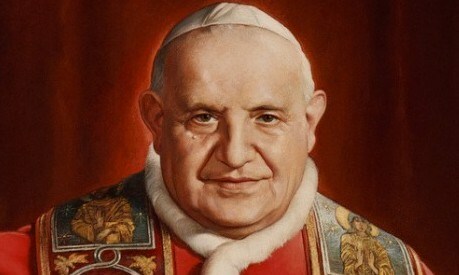 Blessed Pope John XXIII was known to be a great man of peace, and above all things seek to embrace peace and cooperation, between mankind, and also begun the process of Ecumenism in order to reunite the divided fragments of God’s Church back into the One, Holy, Catholic, and Apostolic Church that is our Church. 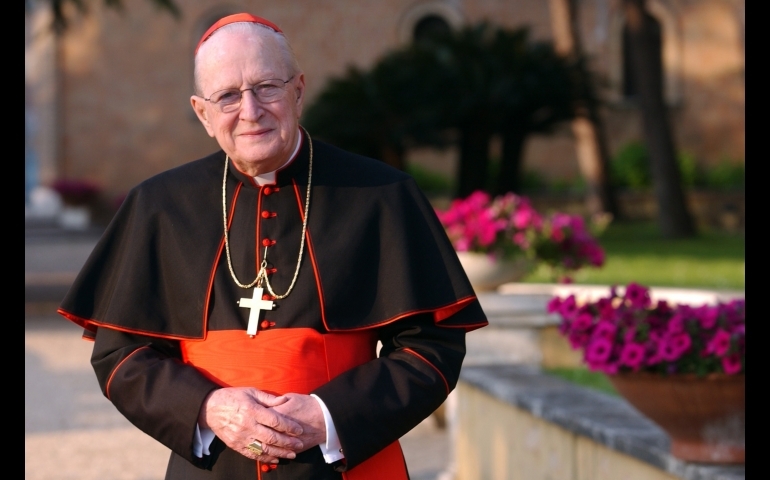 He was also known for his Encyclical Pacem in Terris (Peace on earth), which was released just months after the world was almost engulfed in an all-out nuclear war between the two superpowers, the United States of America (USA) and the Soviet Union (USSR) during the height of the Cold War in the Cuban Missile Crisis. Blessed Pope John XXIII worked hard ceaselessly to promote peace between the parties in conflict, for the good of all mankind, all of whom are the children of the same one God. 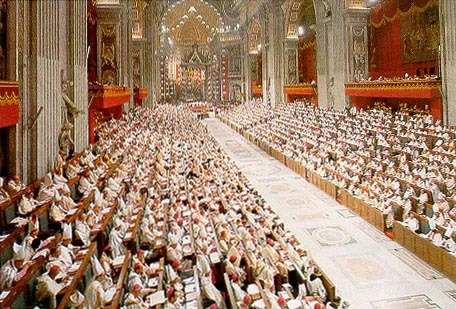 Blessed Pope John XXIII also convoked the Second Vatican Council, which brought the Church in line with the developments in the world, and also to make the Church more relevant in the increasingly rapid new developments in our world, and the rise of apathy towards religion in general. He would pass away before the Council was completed, but his legacy continued on until today. Blessed Pope John Paul II ‘the Great’ was a well-known Pope, a Pope of youths, and a hardworking Pope, who travelled around the world to visit all the flocks of the Lord that had been entrusted to him as the Successor of St. Peter the Apostle, as the Vicar of Christ. He was instrumental in the end of Communism in Eastern Europe, ending persecutions against the people of the faith, and also open boundaries and barriers that had been long in place since the beginning of the Cold War. 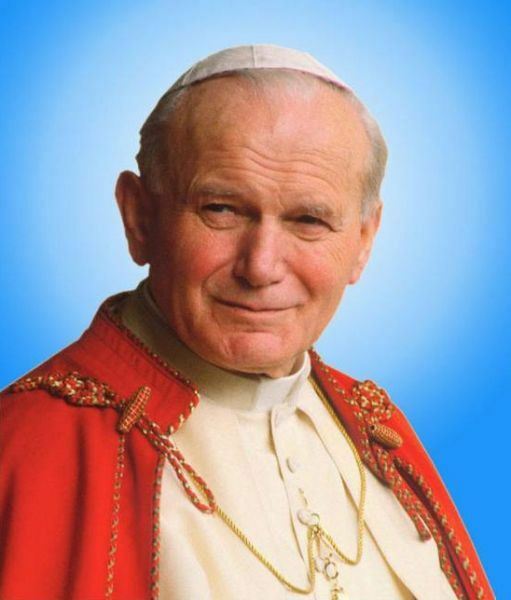 Blessed Pope John Paul II has also renewed the zeal for the faith amongst many around the world, and especially in youths, to whom he dedicated a special event, the World Youth Day, in order to commemorate the faith, particularly amongst the youths of the faith, around the globe. 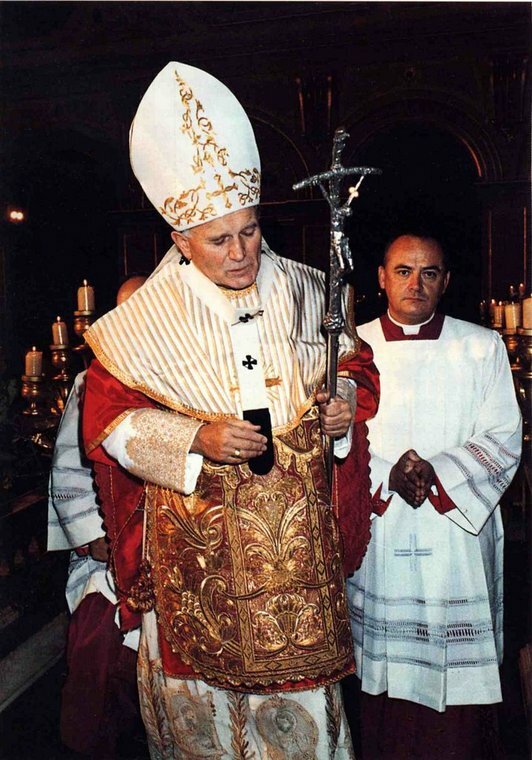 He inspired many through his works, his Encyclicals, and especially his perseverance despite being troubled with a worsening Parkinson’s disease condition, that made him to labour until his passing on 2 April 2005. Both Popes had been very influential, hardworking, and very holy leaders of the One Church of the Lord Jesus Christ, and they had done much to strengthen the faith and the Church, and bring God closer to many, bringing them closer to salvation. 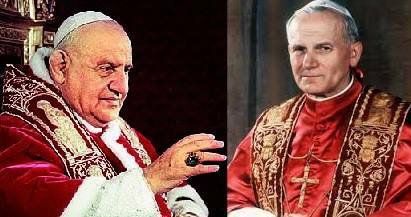 I hope to soon be able to ask for the intercessions of Pope St. John XXIII and Pope St. John Paul II the Great, and I pray that they will intercede for us sinners around the world, and pray for us, till we are greeted by them at the doors of heaven when it is time for us to be with the Lord again. Now we wait for the official announcement on the date of the Canonisation. Blessed Pope John XXIII, pray for us! The world today needs peace more than ever, as violence and hatred increasingly become more common in our society. We should profess love and peace, not hatred and violence! 6. But the mischief is often caused by erroneous opinions. Many people think that the laws which govern man’s relations with the State are the same as those which regulate the blind, elemental forces of the universe. But it is not so; the laws which govern men are quite different. The Father of the universe has inscribed them in man’s nature, and that is where we must look for them; there and nowhere else. 7. These laws clearly indicate how a man must behave toward his fellows in society, and how the mutual relationships between the members of a State and its officials are to be conducted. They show too what principles must govern the relations between States; and finally, what should be the relations between individuals or States on the one hand, and the world-wide community of nations on the other. Men’s common interests make it imperative that at long last a world-wide community of nations be established. 10. When, furthermore, we consider man’s personal dignity from the standpoint of divine revelation, inevitably our estimate of it is incomparably increased. Men have been ransomed by the blood of Jesus Christ. Grace has made them sons and friends of God, and heirs to eternal glory. 8. The natural rights of which We have so far been speaking are inextricably bound up with as many duties, all applying to one and the same person. These rights and duties derive their origin, their sustenance, and their indestructibility from the natural law, which in conferring the one imposes the other. 9. Thus, for example, the right to live involves the duty to preserve one’s life; the right to a decent standard of living, the duty to live in a becoming fashion; the right to be free to seek out the truth, the duty to devote oneself to an ever deeper and wider search for it. 30. Once this is admitted, it follows that in human society one man’s natural right gives rise to a corresponding duty in other men; the duty, that is, of recognizing and respecting that right. Every basic human right draws its authoritative force from the natural law, which confers it and attaches to it its respective duty. Hence, to claim one’s rights and ignore one’s duties, or only half fulfill them, is like building a house with one hand and tearing it down with the other. 31. Since men are social by nature, they must live together and consult each other’s interests. That men should recognize and perform their respective rights and duties is imperative to a well ordered society. But the result will be that each individual will make his whole-hearted contribution to the creation of a civic order in which rights and duties are ever more diligently and more effectively observed. 34. Man’s personal dignity requires besides that he enjoy freedom and be able to make up his own mind when he acts. In his association with his fellows, therefore, there is every reason why his recognition of rights, observance of duties, and many-sided collaboration with other men, should be primarily a matter of his own personal decision. Each man should act on his own initiative, conviction, and sense of responsibility, not under the constant pressure of external coercion or enticement. There is nothing human about a society that is welded together by force. Far from encouraging, as it should, the attainment of man’s progress and perfection, it is merely an obstacle to his freedom. 35. Hence, before a society can be considered well-ordered, creative, and consonant with human dignity, it must be based on truth. St. Paul expressed this as follows: “Putting away lying, speak ye the truth every man with his neighbor, for we are members one of another.”(25) And so will it be, if each man acknowledges sincerely his own rights and his own duties toward others. 37. Now the order which prevails in human society is wholly incorporeal in nature. Its foundation is truth, and it must be brought into effect by justice. It needs to be animated and perfected by men’s love for one another, and, while preserving freedom intact, it must make for an equilibrium in society which is increasingly more human in character. 44. Today, on the contrary the conviction is widespread that all men are equal in natural dignity; and so, on the doctrinal and theoretical level, at least, no form of approval is being given to racial discrimination. All this is of supreme significance for the formation of a human society animated by the principles We have mentioned above, for man’s awareness of his rights must inevitably lead him to the recognition of his duties. The possession of rights involves the duty of implementing those rights, for they are the expression of a man’s personal dignity. And the possession of rights also involves their recognition and respect by other people. 51. Governmental authority, therefore, is a postulate of the moral order and derives from God. Consequently, laws and decrees passed in contravention of the moral order, and hence of the divine will, can have no binding force in conscience, since “it is right to obey God rather than men “(34). 53. Men, both as individuals and as intermediate groups, are required to make their own specific contributions to the general welfare. The main consequence of this is that they must harmonize their own interests with the needs of others, and offer their goods and services as their rulers shall direct—assuming, of course, that justice is maintained and the authorities are acting within the limits of their competence. Those who have authority in the State must exercise that authority in a way which is not only morally irreproachable, but also best calculated to ensure or promote the State’s welfare. 64. The public administration must therefore give considerable care and thought to the question of social as well as economic progress, and to the development of essential services in keeping with the expansion of the productive system. Such services include road-building, transportation, communications, drinking-water, housing, medical care, ample facilities for the practice of religion, and aids to recreation. The government must also see to the provision of insurance facilities, to obviate any likelihood of a citizen’s being unable to maintain a decent standard of living in the event of some misfortune, or greatly in creased family responsibilities. 73. A natural consequence of men’s dignity is unquestionably their right to take an active part in government, though their degree of participation will necessarily depend on the stage of development reached by the political community of which they are members. 75. There is every indication at the present time that these aims and ideals are giving rise to various demands concerning the juridical organization of States. The first is this: that a clear and precisely worded charter of fundamental human rights be formulated and incorporated into the State’s general constitutions. 81. This will be readily understood when one reflects that it is quite impossible for political leaders to lay aside their natural dignity while acting in their country’s name and in its interests They are still bound by the natural law, which is the rule that governs all moral conduct, and they have no authority to depart from its slightest precepts. 104. Here surely is our proof that, in defining the scope of a just freedom within which individual citizens may live lives worthy of their human dignity, the rulers of some nations have been far too restrictive. Sometimes in States of this kind the very right to freedom is called in question, and even flatly denied. We have here a complete reversal of the right order of society, for the whole raison d’etre of public authority is to safeguard the interests of the community. Its sovereign duty is to recognize the noble realm of freedom and protect its rights. 106. And among man’s personal rights we must include his right to enter a country in which he hopes to be able to provide more fittingly for himself and his dependents. It is therefore the duty of State officials to accept such immigrants and—so far as the good of their own community, rightly understood, permits—to further the aims of those who may wish to become members of a new society. 113. Everyone, however, must realize that, unless this process of disarmament be thoroughgoing and complete, and reach men’s very souls, it is impossible to stop the arms race, or to reduce armaments, or—and this is the main thing—ultimately to abolish them entirely. Everyone must sincerely co-operate in the effort to banish fear and the anxious expectation of war from men’s minds. But this requires that the fundamental principles upon which peace is based in today’s world be replaced by an altogether different one, namely, the realization that true and lasting peace among nations cannot consist in the possession of an equal supply of armaments but only in mutual trust. And We are confident that this can be achieved, for it is a thing which not only is dictated by common sense, but is in itself most desirable and most fruitful of good. 130. Recent progress in science and technology has had a profound influence on man’s way of life. This progress is a spur to men all over the world to extend their collaboration and association with one another in these days when material resources, travel from one country to another, and technical information have so vastly increased. This has led to a phenomenal growth in relationships between individuals, families and intermediate associations belonging to the various nations, and between the public authorities of the various political communities. There is also a growing economic interdependence between States. National economies are gradually becoming so interdependent that a kind of world economy is being born from the simultaneous integration of the economies of individual States. And finally, each country’s social progress, order, security and peace are necessarily linked with the social progress, order, security and peace of every other country. 132. No era will ever succeed in destroying the unity of the human family, for it consists of men who are all equal by virtue of their natural dignity. Hence there will always be an imperative need—born of man’s very nature—to promote in sufficient measure the universal common good; the good, that is, of the whole human family. 144. We are, of course, aware that some of the points in the declaration did not meet with unqualified approval in some quarters; and there was justification for this. Nevertheless, We think the document should be considered a step in the right direction, an approach toward the establishment of a juridical and political ordering of the world community. It is a solemn recognition of the personal dignity of every human being; an assertion of everyone’s right to be free to seek out the truth, to follow moral principles, discharge the duties imposed by justice, and lead a fully human life. It also recognized other rights connected with these. 146. Here once more We exhort Our sons to take an active part in public life, and to work together for the benefit of the whole human race, as well as for their own political communities. It is vitally necessary for them to endeavor, in the light of Christian faith, and with love as their guide, to ensure that every institution, whether economic, social, cultural or political, be such as not to obstruct but rather to facilitate man’s self betterment, both in the natural and in the supernatural order. 150. If these policies are really to become operative, men must first of all take the utmost care to conduct their various temporal activities in accordance with the laws which govern each and every such activity, observing the principles which correspond to their respective natures. Secondly, men’s actions must be made to conform with the precepts of the moral order. This means that their behavior must be such as to reflect their consciousness of exercising a personal right or performing a personal duty. 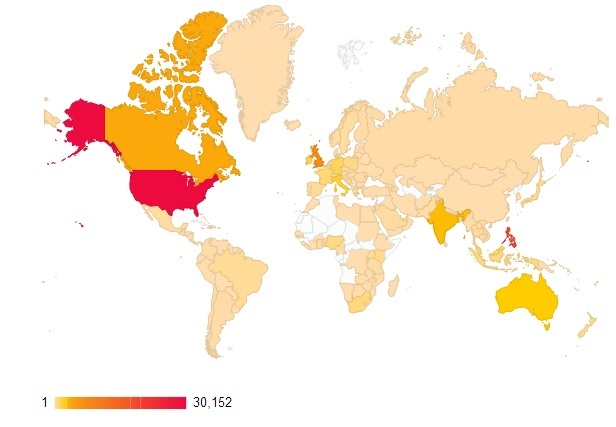 Reason has a further demand to make. 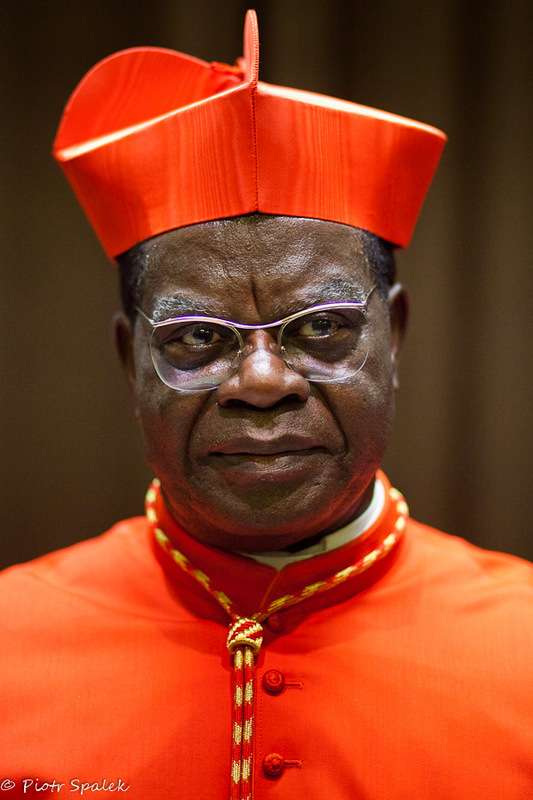 In obedience to the providential designs and commands of God respecting our salvation and neglecting the dictates of conscience, men must conduct themselves in their temporal activity in such a way as to effect a thorough integration of the principal spiritual values with those of science, technology and the professions. 158. It is always perfectly justifiable to distinguish between error as such and the person who falls into error—even in the case of men who err regarding the truth or are led astray as a result of their inadequate knowledge, in matters either of religion or of the highest ethical standards. A man who has fallen into error does not cease to be a man. He never forfeits his personal dignity; and that is something that must always be taken into account. Besides, there exists in man’s very nature an undying capacity to break through the barriers of error and seek the road to truth. God, in His great providence, is ever present with His aid. Today, maybe, a man lacks faith and turns aside into error; tomorrow, perhaps, illumined by God’s light, he may indeed embrace the truth. 159. Again it is perfectly legitimate to make a clear distinction between a false philosophy of the nature, origin and purpose of men and the world, and economic, social, cultural, and political undertakings, even when such undertakings draw their origin and inspiration from that philosophy. True, the philosophic formula does not change once it has been set down in precise terms, but the undertakings clearly cannot avoid being influenced to a certain extent by the changing conditions in which they have to operate. Besides, who can deny the possible existence of good and commendable elements in these undertakings, elements which do indeed conform to the dictates of right reason, and are an expression of man’s lawful aspirations? 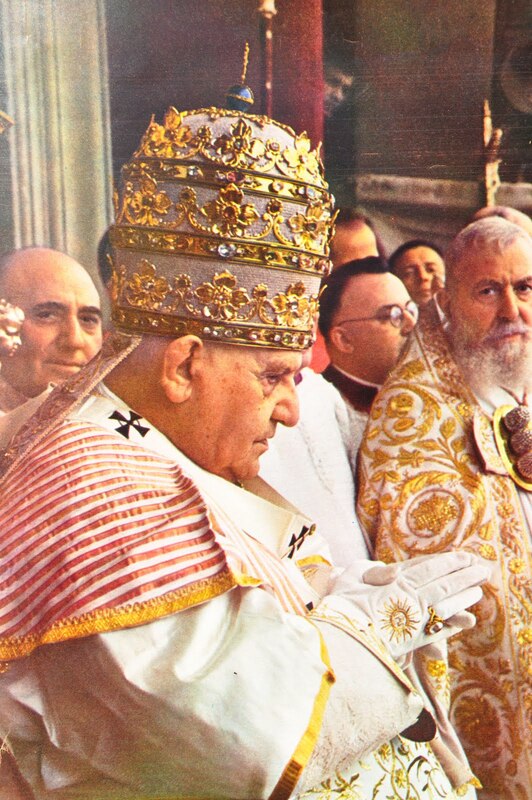 Today, 3 June 2013, marks 50 years since the passing of a great Pope, Blessed Pope John XXIII, who died from stomach cancer he had suffered for years, on 3 June 1963. 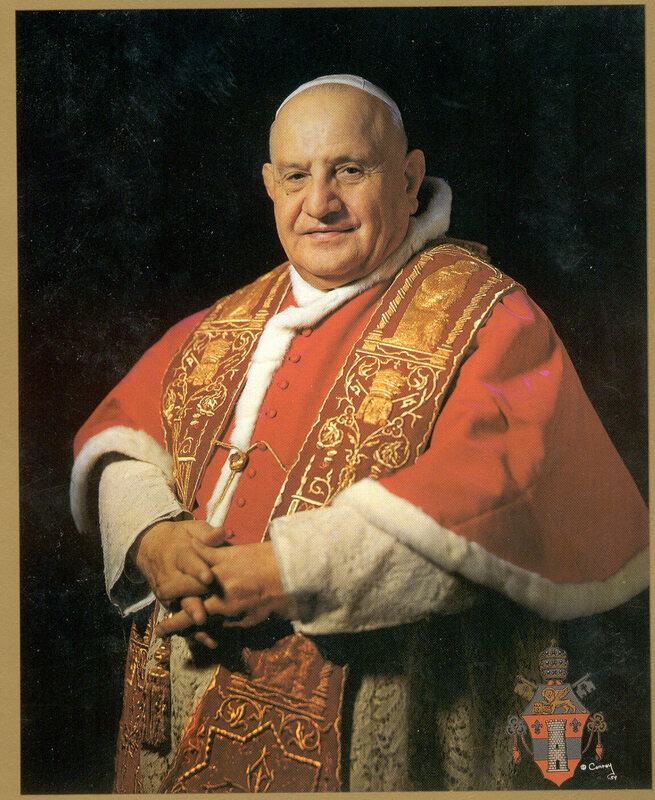 Blessed Pope John XXIII was Cardinal Angelo Roncalli, the former Patriarch of Venice, who was elected to the Pontificate in 1958 succeeding Pope Pius XII. 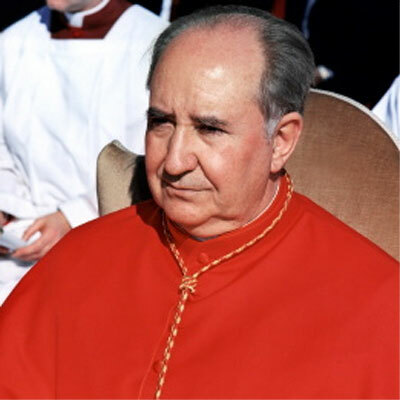 He was a poor farmer’s son, who joined the Vatican diplomatic career and eventually was made the Patriarch of Venice, before succeeding as Pope in the 1958 Conclave. 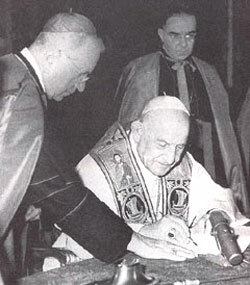 Blessed Pope John XXIII was most well-known for his role in convoking and planning for the Second Vatican Council, which ultimately would take place between 1962 and 1965, with the Council works continued by his successor Pope Paul VI in 1963 upon his passing. But Blessed Pope John XXIII was also well-known for another work, that is peace, which is one of the hallmark of his pontificate. He managed to help arrange peace talks between the USA and the USSR, the Cold War superpowers, which due to the Cuban Missile Crisis in October 1962 and preceding conflicts, almost went into an all-out nuclear war at the time. 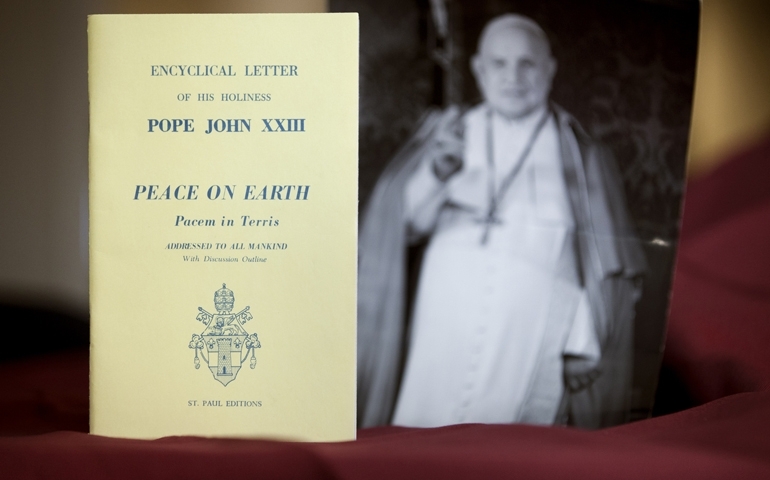 Blessed Pope John XXIII published the well-known encyclical on peace, Pacem in Terris (Peace on Earth) just months before his death, but his works on peace help ensure that the destruction of mankind and God’s creation did not happen. Pray for us, o Blessed Pope John XXIII, that all of God’s children can truly become peacemakers on their own, and truly practice the love that God has planted in them, that love and peace will reign in this world, triumphant over evil, hatred, and violence. 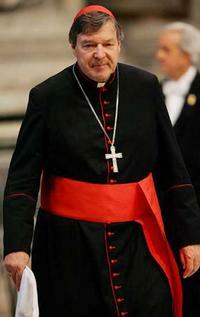 Pope Francis had appointed an advisory board composed of eight Cardinals and some other prelates whose function is to help the Holy Father in his reform of the Roman Curia to increase its efficiency. As mentioned, the first meeting of the group would be from 1-3 October 2013, so I would not expect significant changes to the Roman Curia before the end of this year, or even early next year (2014).